A beautiful kitchen is very important to many people, after all, you spend a lot of time there - cooking, baking and eating. When preparing the food, especially the countertop must endure a lot. We of worktops Germany pay particular attention to the fact that our kitchen worktops have to endure a lot in the course of their lives, such as: fat splashes, knives that slip off the board when cutting, hot pots - which come straight from the stove, etc. Depending on the material, the kitchen surfaces are completely coping with these challenges differently. On our site you will find the ideal worktop for your kitchen. We have a vast and diverse selection of materials and their prices. Star Galaxy, Azul Imperial Extra, Nero Impala, Amazon, Blanco Zeus, Rosa Beta, Ivory Brown / Shivakashi oder auch Unsui are the most popular materials chosen for a countertop . The advantages of the material are, its easy care, scratch and abrasion resistance and temperature resistance. In addition, its individual design diversity contributes to the attractiveness of natural stone. The innovative artificial stone with its outstanding features and its appearance is used more and more frequently as a kitchen worktop for the realization of individually designed kitchen spaces. 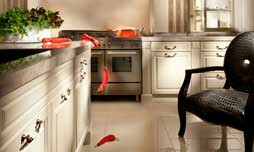 When choosing a kitchen worktop, uncompromising quality and easy-care, handling should be decisive. A ceramic plate produced by us withstands the highest demands. 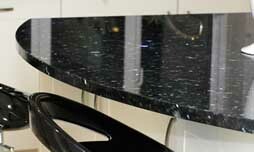 Individual worktops according to your requirements in the desired size, shape and material. 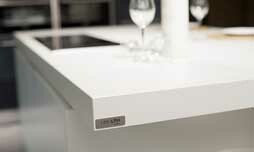 Worktops from MAAS GmbH combine functionality and design. Worktops provide unique and visual sensory impressions. These worktops are unique in terms of properties. Would you like to always be informed? No problem - then follow us on Facebook, Twitter oder Google + and be the first to know when we've reduced our products.